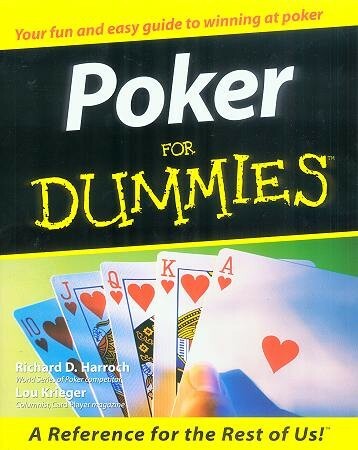 Poker For Dummies covers the basics for beginners or perhaps you've played for years, but you just don’t know how to win. This handy guide will help you walk away from the poker table with winnings, not lint, in your pockets. If you’re a poker expert, you still can benefit - some of the suggestions may surprise you, and you can certainly learn from the anecdotes from professional players like T.J. Cloutier and Stu Unger. Know what it takes to start winning hand after hand by exploring strategy, getting to know antes and betting structure, knowing your opponents, and understanding the odds. Also covers Poker games such as Seven-Card Stud, Omaha, and Texas Hold'em, Setting up a game at home, Playing in a casino: Do's and don'ts, Improving your play with Internet and video poker, Deciphering poker sayings and slang, Ten ways to read your opponent's body language, Playing in poker tournaments, Money management and recordkeeping, Knowing when and how to bluff. Learning the rules can be quick work, but becoming a winning player takes considerably longer.